Tuesday, 7:15 am: School Spotlight: Princeton High School Concert Choir. Tuesday, 5:30 pm: Music with Minnesotans: Christopher Hopkins, the Makeover Guy. Tuesday, 7:15 pm: School Spotlight: Princeton High School Concert Choir. Thursday, 3 pm hour: Regional Spotlight: Minnesota Bach Ensemble. Saturday, 7 pm: Song of America, Part 13: Places That Sing to Us. Sunday, 6 am: Pipedreams: A Juilliard Student Showcase. Sunday, 1 pm: SymphonyCast: The Bournemouth Symphony Orchestra performs works of Janacek, Beethoven, and Tchaikovsky at the BBC Proms. Monday, noon: Learning to Listen: The Brandenburg Concertos. Monday, 8 pm: Saint Paul Chamber Orchestra: Soprano Dawn Upshaw and works of Piazzolla, Iglesias, and Golijov. Miguel Harth-Bedoya conducts. Tuesday, 7:15 am: School Spotlight: Robbinsdale Cantori and Bel Canto Choirs and Chamber Strings. Tuesday, 5:30 pm: Music with Minnesotans: Dr. Jon Hallberg. Tuesday, 7:15 pm: School Spotlight: Robbinsdale Cantori and Bel Canto Choirs and Chamber Strings. There’s more to the story, though, as there often is. Lara Downes wants to hear the stories of other exiles — contemporary exiles — and she wants to share those experiences with as many people as possible. The Exiles Project is an interactive micro-site designed to collect and share individual stories of exile. Visit the site and submit your own experiences or reminiscences of exile, displacement and discovery. Be a part of The Exiles Project — a way to explore the narratives of exile on both universal and personal levels. Submit your story here. Not all of the content from an episode of New Classical Tracks makes the audio cut. 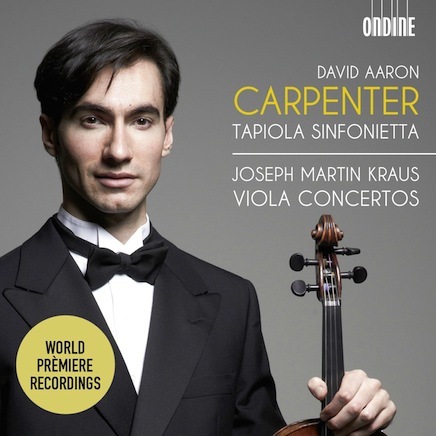 Here is further information and interviews relating to the new disc, Kraus: Viola Concertos by David Aaron Carpenter. American violist and violinist David Aaron Carpenter was in the midst of his final exams at Princeton University a few years ago when he got the news that he’d be performing with the Lucerne Symphony Orchestra. And Carpenter says it wasn’t your average performance. Not only was he filling in for a violin superstar — Maxim Vengerov — he also WASN’T going to be playing a concerto by Beethoven or Brahms or Mozart. Instead, Carpenter had to learn a NEW concerto, the Viola Tango Rock Concerto, written especially for Vengerov by composer Benjamin Yusupov. Saturday is Bastille Day, the national holiday of France. Take our Bastille Day quiz, and test your knowledge of Debussy, Saint-Saëns and Bizet! And if you’re still in a test-taking mood, try our venerable choral quiz. How do you introduce someone to Classical Music? Brian Newhouse, Managing Director of Classical Music at MPR | APM put forth a question to the classical staff last Friday, and the emails started flying. It seems they’re expecting a foreign exchange student, and that student asked to be introduced to Classical music. What happened next was a flurry of “desert island” pieces from an array of our staff. We wanted to share with you — and have you weigh-in — our growing list of classic classical pieces. “Mahler’s Second Symphony, particularly the final movement, although it loses much of its power when not preceded by the remainder of the work, especially Urlicht (the fourth of five movements). The sublime beauty and transporting power of that final movement is a gem set in the rest of the work. Bach’s Cello Suites — all of them. They are meditative and transcendent, and are known to bring me to tears, especially when performed by Pablo Casals. “When I was 15 I had this oddball, eclectic love of The Beatles, rock and roll, Broadway shows and Stan Kenton’s kind of music — a love inspired by my jazz trumpeter Dad. I hadn’t been exposed much at all to classical, but when I was, it was head-on with the finale to Mahler’s Resurrection Symphony with Leonard Bernstein and the NY Phil. No half-measures! As a (then) new singer who liked big Broadway ‘production-number’ endings and big brassy trumpet sections, it was perfect. Rattled the rafters. Same year: [Carl Orff’s] Carmina Burana and Brahms’ Symphonies for the first time: Philadelphia Orchestra. Loved stuff that made noise with lots of brass and percussion. Now it’s your turn. Give us your list of “must listen” works in the comments below. Test your knowledge of choral music, composers, and terminology. While it is multiple choice — no short answers or essays here, although you may feel free to leave them in the comments — we doubt that this is an easy ‘A’. 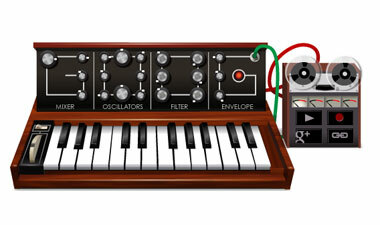 Google is helping the world to celebrate what would have been Robert Moog’s 78th birthday with a mini-moog, (er, mini-goog) synthesizer. While we’re still getting used to it, we want to get your creative juices flowing, and have you share a composition or two with us! You can click the keys, or use your keyboard (your home row is a good place to start). If you’re familiar with waveforms, attack/decay/sustain, etc., you should check out this explainer PDF from moogmusic for what the particular knobs/switches do what. Otherwise, just mess around and have fun. When you’re ready to record, you can do up to 4 tracks. Record each track by clicking on the VU meter — it’ll light up a little bit, then hitting the Record button. Then click the next VU meter to do the 2nd track… and the 3rd and 4th. You can go back and re-record a track by clicking on the meter again. When you’re all done, click the chain link icon and drop it in the comments. Crescendo Project and Classical MPR Present Roll Credits Live! Are you a young professional who loves classical music? Join us for Roll Credits Live on Wednesday, May 16. It’s a free event, open to Classical MPR listeners in their 20s and 30s and members of the Crescendo Project, the Minnesota Orchestra’s Young Professionals Group. To be honest, watching the recording of a disc-based radio show normally offers all the excitement of a cow looking over a fence. A couple of people playing CDs and chatting. Flash mob fodder! Of course, Guernseys have their charms, and so does Roll Credits, live at the UBS Forum. Classical MPR hosts Lynne Warfel and Bill Morelock will play film music — the classics and the new — and chat! Enlivening the evening may be Lynne’s threatened dramatic reading of President Merkin Muffley’s monologue from Doctor Strangelove, in the voice of Katherine Hepburn. They will, certainly, trot out the old favorites from the Golden Age of Hollywood, when the music was better than the acting, and from today’s films, when the acting is better than … well, we can argue about that when the time comes. So if you’re a movie music fan, come on Wednesday, May 16, at 6 p.m., and hang out with a couple of movie music fans, and join ’em in the pasture. Cue the Copland and the open chords! For more music and movies, visit our Roll Credits and Flicks in Five page. Maurice Jarre: Is Paris Burning?